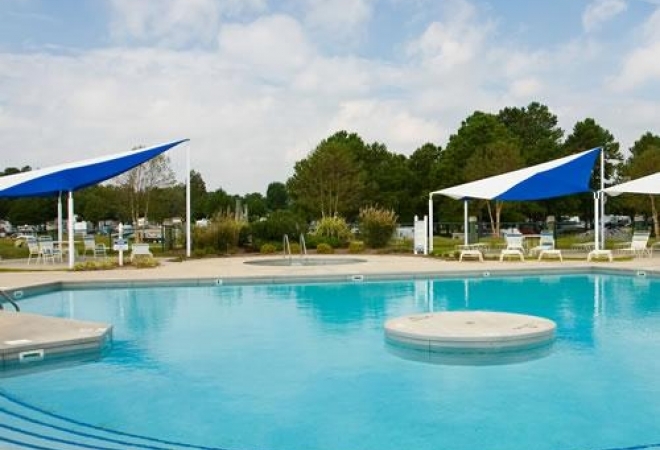 Twin Lakes RV Resort is a beautiful RV resort in North Carolina, located on a peninsula between the Pamlico River and the Chocowinity Bay. We work hard to maintain a family-friendly environment that keeps guests coming back to our resort year after year. We pride ourselves on providing genuine southern hospitality that guests can look forward to experiencing when booking a visit to Twin Lakes RV Resort. With a volleyball court, basketball court, a game room, swimming pool, two playgrounds and a boat ramp, there's something for just about everybody. Fishermen will love spending a day angling on our lakes. For off-site retreats, we offer a quick ferry ride to North Carolina’s quiet and relaxed barrier islands. Excellent golf courses and island-style restaurants are also located just a short distance from the resort. We look forward to welcoming you to Twin Lakes RV Resort, our exceptional North Carolina RV resort.